Red bouquets are a popular choice for wedding flowers since red is a universal symbol of romance. There are many flower varieties in different hues of red ideal for wedding bouquets. Classic red roses are the most popular flower choice. 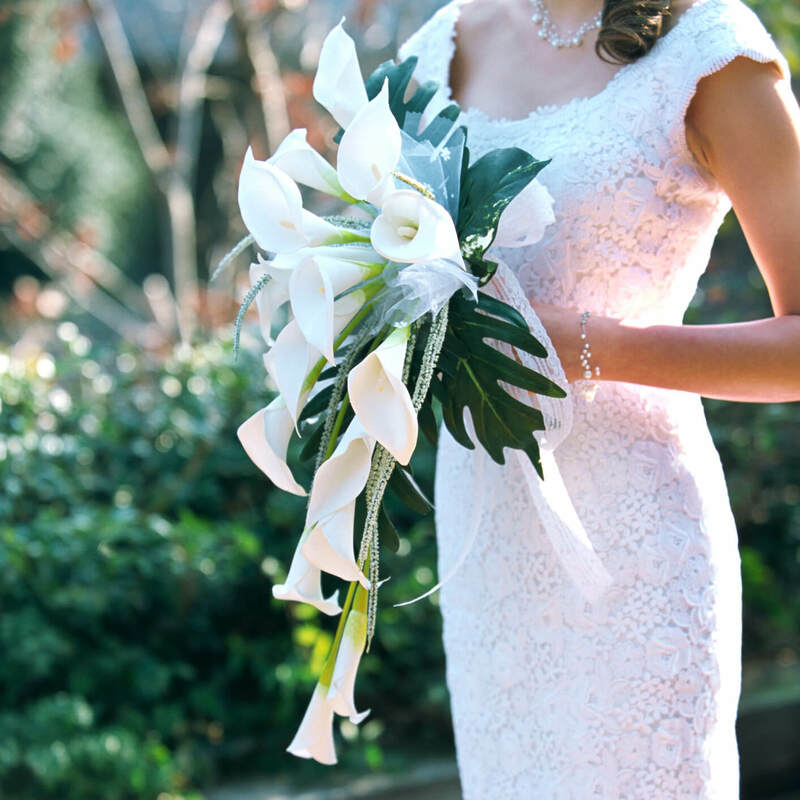 A traditional cascading bouquet is an elegant and timeless floral style. Calla lilies are a popular wedding flower because of their sleek sophistication, and combining red roses and red lilies gives a bouquet an elegant touch. Either the roses or the lilies can also have a subtle hint of yellow or orange on the petals for more visual texture and interest. A warm, dusky red shade is perfect for fall wedding flowers, and framing red flowers with crisp autumn leaves is perfect for fall wedding bouquets that will match nature's seasonal palette. Many different types of blooms are available in red hues, including sweetly innocent anemone flowers. These wide blooms have a contrasting center that gives even a simple, basic bouquet an extra something special. Rich, dark red flowers tied in a tight bundle are a chic choice for fall weddings. The darker hues of this bouquet are best for later autumn events, and trimming the bouquet with wisps of black feathers gives it an ultra-modern touch. A bride doesn't necessarily have to carry flowers on her wedding day. A spicy bouquet of bright red chili peppers is a fun and unique alternative perfect for a southwestern wedding. Other alternatives include a feather bouquet, strawberry bouquet, or leaf bouquet with different shades of red. Flowers don't have to be completely red to create red wedding bouquets. Pale yellow or peach roses with red tips are a beautiful choice to give the bouquet more color without losing the overall red palette. How a bouquet is designed is just as important as its color. Red, long-stemmed roses are the ultimate romantic flower, and tying the roses with a braid of red and white satin ribbon and a luxurious strand of pearls accentuates their beauty and coordinates with the red color. A bouquet of rich red poinsettias is perfect for a winter bride. These blooms are so large that just a few flowers can make a beautiful bouquet on a tight budget, and poinsettias are perfect for decorating a Christmas wedding reception as well. Daisies are a sweetly innocent wedding flower that can be given a bit more passion by choosing bold red blooms. A bouquet of just daisies is perfect for a casual garden wedding, or you can combine the daisies with roses or other flowers for a more elegant arrangement. Red is just a dark shade of pink, and adding pink blooms to a red bouquet gives it a sweet contrast without losing the red hue. Roses and calla lilies are popular for two-bloom bouquets, or other red flowers can be used such as daisies, carnations, mums, or tulips. A daring bride who plans to wear a red wedding dress may want to coordinate a red wedding bouquet with her attire, but a red and white bouquet is a better option so the flowers are more visible and too much red doesn't overwhelm the wedding palette. Red is a perfect color for any wedding bouquets, from the bride's bouquet to the bridesmaids' flowers to the flower girl's simple arrangement. Red wedding flowers are also beautiful as centerpieces, on boutonnieres, and anywhere else flowers will be used to decorate this romantic day.